Disney's Hollywood Studios - The Mickey Wiki: Your Walt Disney World Encyclopedia! A replica of Grauman's Chinese Theater houses the Great Movie Ride in Disney's Hollywood Studios. Disney's Hollywood Studios (formerly Disney-MGM Studios) is a theme park located in Walt Disney World. Like most things in Walt Disney World, Disney's Hollywood Studios can trace its origins back to Walt Disney himself. In the 1960s, Walt wanted to build a theme park that would show guests the movie making process . At that time, Universal Studios had a popular backstage tram tour, and Walt wanted to do something similar on the backlot of the Disney Studios . Due to land costs and potential traffic problems however, this idea never came to fruition. 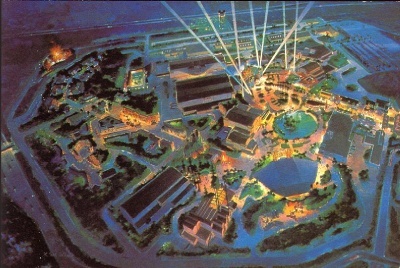 Although the Disney Studios backlot tour was never built, the idea would later resurface. The genesis for what would eventually become Disney's Hollywood Studios began in the mid-1980s. Imagineers led by Marty Skylar and Randy Bright were given the task of creating two new pavilions for Future World in EPCOT Center . One of the pavilions they created was to be called the Great Movie Ride pavilion. The main attraction of the pavilion would have taken guests through various movie scenes and was very similar to the attraction of the same name that would eventually open at Disney-MGM Studios. Michael Eisner, then the CEO of the Disney Company, decided that the idea for the pavilion was strong enough to warrant its own theme park and he told his Imagineers to begin working on it. At the same time that the new EPCOT Center pavilions were being designed, Disney decided that it needed a new production studio due to the dramatic increase in the Disney production schedule during the 1980s. Instead of spending a lot of money on land, it was decided that the studio would be built on the property they already owned in Florida. This need for a new production studio was one of the driving forces behind the inclusion of a studio tour in the new Disney theme park. Another factor that played a crucial role in the creation of the Disney-MGM Studios was that in 1982 Universal Studios was planning on building an East Coast theme park in Orlando. Universal was looking for a partner in the venture, so they approached Paramount Studios’ CEO Michael Eisner about joining them in the project . Eisner declined Universal's proposal and the plans for a Universal East theme park were eventually tabled. When Eisner was named CEO of Disney in 1984 however, he knew about Universal's theme park plans and wanted to beat them to the punch . Eisner decided to build a movie theme park of his own, and had Imagineers start working on the concept. The idea of a Disney movie theme park was kept on the back burner until Universal announced its plans in 1985. After the announcement, Michael Eisner announced that the Disney was already working on a movie based theme park which would be the third gate in Walt Disney World. Before the new park was even announced Disney had already been working behind the scenes to acquire the rights to the name and logo of Metro-Golden-Mayer Inc. This led to Disney and MGM agreeing on a contract in 1985, which allowed Disney to use the MGM name, logo and certain film clips . The new theme park would eventually be named Disney-MGM Studios, and would feature the classic MGM logo- Leo the Lion. Construction on Disney-MGM Studios began in 1986 . As mentioned before, besides being a theme park, Disney-MGM Studios was also a working studio. Both animation and live action studios were built, which guests were eventually able to tour and see how Disney made films. Imagineers also wanted the park to be the perfect representation of the "Golden Age of Hollywood." To accomplish this, the park was themed to look like a small version of Hollywood, with replicas of icons such as Grumman’s Chinese Theater, the Hollywood Walk of Fame, and the Brown Derby. To give MGM an "icon," Imagineers created the large "Earful Tower". 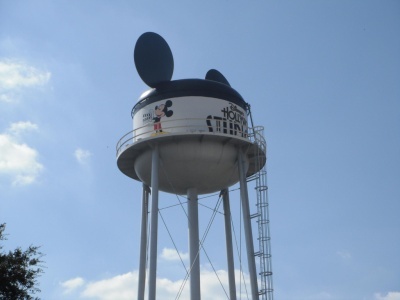 The 130 ft. water tower looked exactly like the one on the Disney Studios lot in California, with the exception of the large Mickey ears placed on top . 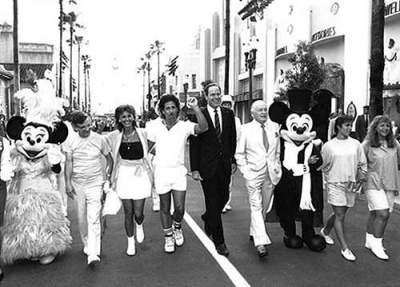 Disney beat Universal to the punch when Disney-MGM Studios opened on May 1, 1989 . When the Studios opened, the park consisted of Hollywood Boulevard, Lakeside Circle, and the Backlot Annex (with the production studio and animation studio making up the rest of the park) . On opening day, Disney-MGM Studios only had five operating attractions. On The Great Movie Ride, guests boarded large trams and rode through scenes from famous movies. Audio Animatronics were used to recreate these scenes, and at the ride’s end guests could see a montage of clips from "great movies". The second and third opening day attractions were The Monster Sound Show and Superstar Television. Both of these attractions were interactive stage shows hosted by Sony . On the Monster Sound Show guests were able to help add sound effects to an "all-star haunted house mystery". Superstar Television on the other hand, showed guests how TV production worked by recreating some of the greatest shows in television, with guests cast in the show. The other opening day attractions consisted of a lengthy tour of the animation studio and a shorter tour of the production studio . "The world you have entered was created by the Walt Disney Company & is dedicated to Hollywood - not a place on a map, but a state of mind that exists wherever people dream & wonder & imagine, a place where illusion & reality are fused by technological magic. We welcome you to a Hollywood that never was - and always will be." Although only opening with five attractions, Disney-MGM Studios was popular and quickly expanded. Later in 1989, the Indiana Jones Stunt Spectacular opened in Lakeside Circle . The stunt show recreated stunts from the Indiana Jones film "Raiders of the Lost Ark". Also in 1989, Star Tours debuted. The new motion simulator attraction that transports guests to the world of the George Lucas' film series Star Wars . In 1990, New York Street was opened for pedestrians (it had previously been part of the Backlot Tour) and the 3D film Muppets Vision 3D was added . Also added to New York Street at this time was the Honey, I Shrunk the Kids Playground . In 1991, two shows were added to the park: Beauty and The Beast and the Voyage of the Little Mermaid. In 1994, the Sunset Boulevard expansion was added to the Studios . As a part of the addition, the Twilight Zone Tower Terror opened. 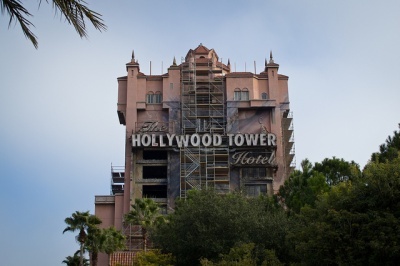 On the Tower of Terror, guests are transported into Rod Sterling's Twilight Zone where they board a haunted elevator. The elevator drops guests 15 stories before rising back up and dropping them again. The next change major to the park came in 1997, when the Monster Sound Show was replaced with the ABC Sound Studio: One Saturday Morning. The new show was used to feature cartoons airing on ABC, a network recently purchased by Disney. In 1998, the nighttime spectacular Fantasmic! was added to Disney-MGM Studios. The new firework show features a battle of good vs. evil staring Mickey Mouse. In 1999, Sunset Boulevard got another thrill ride with the addition of the Rock N' Roller Coaster Starring Aerosmith, which took guests on a high speed tour of Hollywood set to the music of Aerosmith . With the turn of the 21st century, Disney-MGM Studios began to see a series of changes. As a part of the 100 Years of Magic celebration, a 122 ft. tall Sorcerer’s Hat (from the Disney movie Fantasia) was constructed in front of Grumman’s Chinese Theater . At this time, Walt Disney's One Man Dream also opened . The new attraction featured both a museum of Disney artifacts and a short biographical film about Walt Disney himself. In 2003, the animation studio located at the park closed, ending the Animation Tour that had been a staple of the park since opening day . In 2004, New York Street was expanded to include architecture found in San Francisco and renamed The Streets of America. The section of the Studio Tour that resided behind the Streets of America (Residential Street) was then bulldozed in 2004 in order to make room for a new stunt show titled Lights, Motors, Action! Extreme Stunt Show, which opened in 2005 . "The new name reflects how the park has grown from representing the golden age of movies to a celebration of the new entertainment that today’s Hollywood has to offer—in music, television, movies and theater"
Reflected in the name change was the fact that over time the theme of the park had changed. Originally the park was set in the Golden Age of Hollywood, but by 2007 the theme had clearly shifted to a more modern view of filmmaking. By 2008, the park had been renamed Disney's Hollywood Studios; however it took more time to change all the affected signs. Since the 2007 name change there have a few major additions to the Hollywood Studios. In 2008, Mickey's Avenue was renamed Pixar Place, and all attractions on the Avenue were closed . Opening in their place was Toy Story Midway Mania!, a new 4D attraction that lets guests travel through (and play) classic Midway games, while wearing 3D glasses . The opening of Toy Story Midway Mania! was followed by the opening of the American Idol Experience in 2009 . The American Idol Experience was located on Hollywood Boulevard in the ABC Theater and based on the popular television show American Idol. On December 6, 2012 an interactive walkthrough attraction named The Legend of Captain Jack Sparrow replaced the Journey Into Narnia walkthrough attraction . Also in 2012, Sounds Dangerous! officially closed . 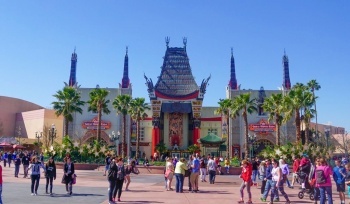 2014 saw a series of changes occur in Disney’s Hollywood Studios. On August 30, the American Idol Experience closed its doors . Subsequently on September 27, the Studio Backlot Tour (an opening day attraction) was closed . Following this pattern of change, in October 2014 Disney announced that the Sorcerer’s Hat (which had been built as a temporary structure in 2001) would finally be demolished in 2015 . This announcement was paired by the announcement that The Legend of Captain Jack Sparrow would be closing for good on November 6, 2014. On July 12, 2015 another opening day attraction The Magic of Disney Animation closed permanently . On March 21, 2016, Disney christened the new Muppet Courtyard area of Disney's Hollywood Studios . In addition to incorporating Muppet Vision 3D, Muppet Courtyard also became the home of PizzeRizzo, Mama Melrose’s Ristorante Italian, and the Gonzo's Royal Flush restrooms. On July 27, 2017, Disney announced that the remaining part of the former Streets of America would be rethemed to Downtown Los Angeles and renamed Grand Avenue . Furthermore, on August 17, 2017, Disney announced that the former Muppet Courtyard would be included in this new theming and renamed Grand Park . Beginning January 18, 2019, Pixar Place was temporarily transformed into a Municiberg city block from Disney's Incredibles . As part of the festivities, Disney introduced the "Where's Jack-Jack" scavenger hunt, the Super Shindig dance party, and an Edna Mode meet and greet. The Incredebles experience is expected to run until September 30, 2019. To see the current Disney's Hollywood Studios map Click Here. Guest's gateway to the rest of Disney's Hollywood Studios, Hollywood Boulevard features The Great Movie Ride housed inside a replica of Grumman's Chinese Theater. On Hollywood Boulevard guests can also find Starring Rolls and The Hollywood Brown Derby Restaurants, as well as a wide variety of shops and tributes to Hollywood landmarks. Originally referred to as the Backlot Annex/Lakeside Circle, this land features the popular attractions Star Tours and the Indiana Jones Epic Stunt Spectacular. On the peaceful lake guests can also find a bevy of restaurants including Min & Bill's Dockside Diner and Dinosaur Gertie's Ice Cream of Extinction. Formally known as Muppet Courtyard, Grand Park is home to the classic Disney attraction Muppet Vision 3D. Created in 2017, Grand Park is themed to urban Los Angeles. The area is also home to PizzeRizzo and Mama Melrose’s Ristorante Italian. In Toy Story Land, guests are shrunk down to the size of a toy as they explore Andy's backyard. Thematically replacing the former Pixar Place area, in Toy Story Land guests can experience two new attractions- Slinky Dog Dash and Alien Swirling Saucers, as well as Toy Story Mania. Outside of the three attractions, Toy Story Land is also home to Woody's Lunchbox, a quick service restaurant. Walt Disney Presents- An exhibition of various items celebrating Walt Disney's life. Guests start out by exploring a Disney museum that tells Walt’s story, before viewing a 15 minute biographical film. Walt Disney Presents also features models and concept art for upcoming Disney attractions, lands, and resorts. Voyage of the Little Mermaid- A live musical retelling the 1989 Disney movie, The Little Mermaid. The show runs for approximately 15 minutes. Disney Junior Dance Party!-An interactive show featuring Disney Junior characters. Characters from popular television shows, Vampirina, , Doc McStuffins, The Lion Guard and Mickey and the Roadster Racers appear. Disney's Hollywood Studio's first major expansion, Sunset Boulevard is themed after Hollywood's theater district. Here guests can find popular attractions such as the Tower of Terror and Rock 'n' Roller Coaster Staring Aerosmith. In addition it its attractions, Sunset Boulevard is also home to plethora of dining and shopping options. The former home to Toy Story Mania, Pixar Place currently houses a series of Incredible themed interactive experiences set in a Municiberg city block. The FastPass + attractions at Disney's Hollywood Studios are broken up into two tiers. Guests may choose one experience from Tier One and two experiences from Tier 2. The Earful Tower was a non-working water tower that was 130 feet tall and 8 1/2 feet in diameter. That gave it a hat size of 342 3/8. “Sheena,” “Full House,” “Wheel of Fortune,” “World Championship Wrestling,” “ESPN College Football Awards,” “Talk Soup,” “Step By Step,” “Barbara Walters Special” and “Live! With Regis & Kathie Lee”. Mulan was the first full-length film to be produced primarily by Walt Disney Feature Animation at Disney-MGM Studios. The HBO series “From the Earth to the Moon”, starring Tom Hanks, was produced in two sound stages throughout 1997 at Disney MGM Studios. The Mickey's of Hollywood store is a spoof of Frederick's of Hollywood, a famous lingerie store. ↑ 3.0 3.1 3.2 Koenig, David. Realityland: True-life Adventures at Walt Disney World. Irvine, CA: Bonaventure, 2007. Print. This page has been accessed 105,676 times.